CLOVIS, Calif. (Feb. 7, 2019) — WBC super lightweight champion Jose Ramirez has fought for many causes near and dear to his heart and to the citizens of California's Central Valley. As he readies to defend his title against Jose "Chon" Zepeda on Sunday at Fresno's Save Mart Center, Ramirez is using his platform to continue the fight against cancer. 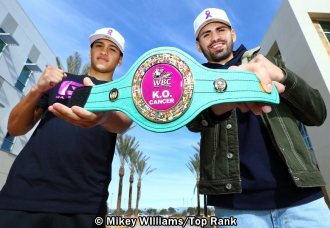 Ramirez, along with undefeated prospect Gabriel Flores Jr., visited cancer patients and their families Thursday at the Community Cancer Institute, one of the nation's premier cancer treatment facilities. "I lost my grandpa to cancer a few months ago, and I saw how important it was that he had the love and support of his family," Ramirez said. "If the patient is fighting, then the family should be there fighting as well. I think that's what you are going to see on Sunday. The whole Central Valley community is also fighting with you guys and will be bringing that motivation and encouragement." When Ramirez walks to the ring, everyone in the arena will hold up a special sign that reads, '"Let's KO Cancer." Ramirez-Zepeda and the 140-pound showdown between former lightweight world champion Ray Beltran and Hiroki Okada will headline a special Top Rank on ESPN card beginning at 7 p.m. ET/4 p.m. PT on ESPN and ESPN Deportes. Flores' bout against Alex Torres Rynn will be part of the ESPN+ undercard stream beginning at 4 p.m. ET/1 p.m. PT.